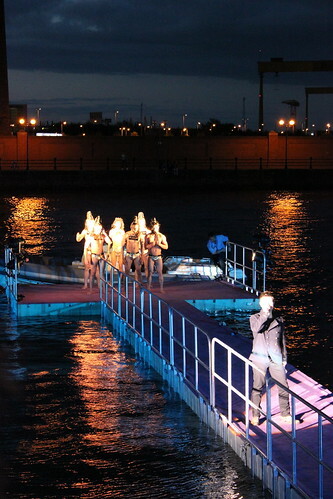 Perhaps one of the most innovative fashion events I have ever attended was “Walking on Water,” run by El Divino in association with Style Academy, Belfast. 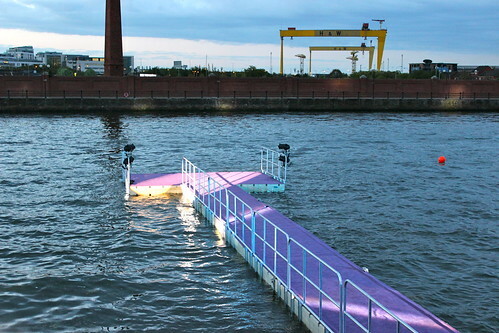 The catwalk wasn’t your average runway with seats either side, No, it was a 150ft floating masterpiece stretching out onto the River Lagan. 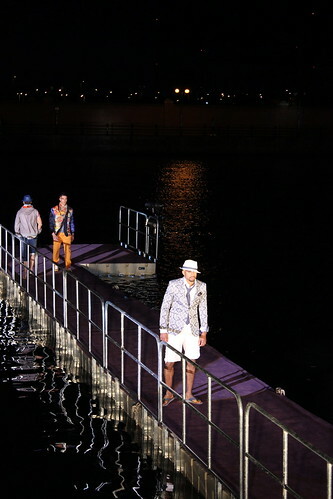 The setting for the show was the ultra chic night spot El Divino, situated right on the water front and from the get-go the atmosphere was electric. The red carpet led us into the bar area where we relaxed before the show. 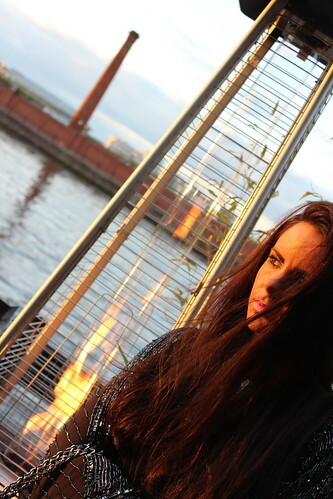 Then just as the sun was beginning to set we made our way outside to get ready for the fashion extravaganza. I was lucky enough to have seats at the front and I could not wait for it to begin. It was a cold night for the month of May & my heart went out to the models strutting their stuff in bikinis & swim-shorts, however, each & every one remained truly professional, posing as if in 40 degree heat! I also wondered if there would be a few wobbles as the catwalk did not look entirely secure, again this did not pose a problem as the models walked tall and steady showing off the stunning creations on display. 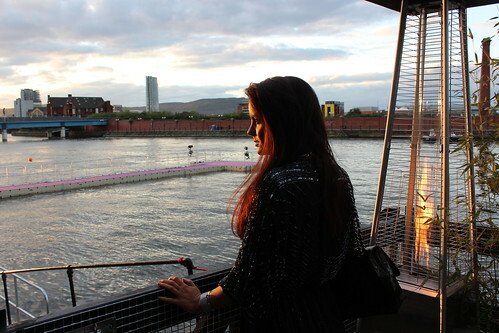 One thing I loved almost as much as the incredible surroundings was the fact that all of the clothes were by talented local designers, with fabulous pieces on show from the likes of Nor Lisa Fashion, The Fairest of them all and Pluck and Devour to name but a few. 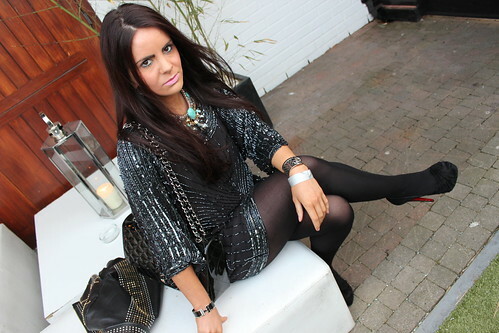 I opted to wear a beaded black dress with weather appropriate tights for the occasion. 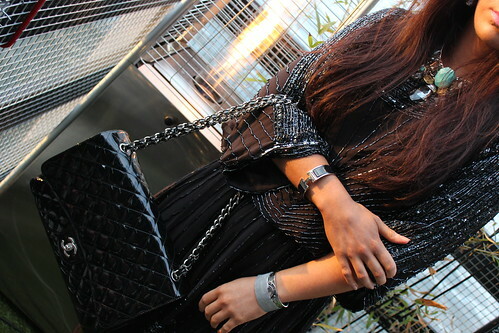 I teamed this with my Christian Louboutin stilettos (debuted here) and an eye-catching necklace from Closet Clothing. One vital piece missing from my ensemble was a winter coat! 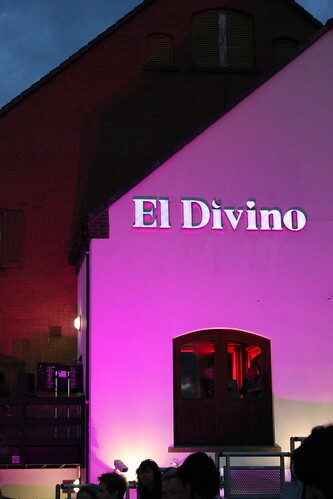 By the end of this event I could hardly feel my fingertips with the cold, yet I simply adored the idea and I look forward to the next ingenious stunt from the teams at El Divino and Style Academy! I hope you enjoy and that you like my outfit choice! More by Dave Henderson – Fairest of them all.